Jennifer, did you hear about the time Luke kept swatting at imaginary bugs? Yoda told him, "Shoo, or shoo not; there is no fly." Also kinda looks like Dobby from Harry Potter. oh my god, what's with the hairy ears?! YES! It's like... Yoda, ET, and Dobby all had a love child. Well, that's not the worst cake I've seen on this site, but it is pretty bad. :) Yoda phone home. I think there must be some sesame street monster muppet in his bloodline too. Actually, it looks like my grandfather. Must be a radioactive yoda. I think he's glowing. Obviously the force was not with this baker. This baker must be from the dark side. 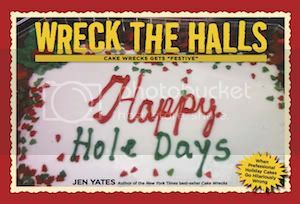 I'm still too busy laughing too hard over why it's Star Wars Day to really appreciate the wreckiness of the cake. It looks kind of like mold. Wow - there is a disturbance in the force.... big time. Ugh! I agree with the Dobby, ET, Yoda assessment. Full of the Dark Side, that one. I shall have bad dreams tonight. I don't know...even without the commentary I would know that was Yoda in a heartbeat. I think the decorator did a good job - I don't see ET at all. So, Yoda is the child of Kermit The Frog and Miss, Piggy. Then he had a baby with ET. Then that baby had a baby with Dobby. 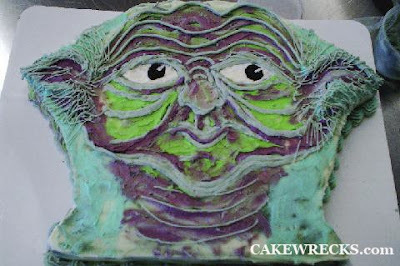 Then the grand child of Kermit and Piggy found a baker who was high enough to put his face on a cake. Two wrecks in one day?
. . . then stops at this cake. wv: berbla I'm hungry and my tummy is berblaing. OMG! I totally snarfed at "Shoo, or shoo not; there is no fly." That made my day. I'm sending it to everyone I know. Love it. Jen, I heart you! Don't forget the authentically mouldy-looking icing. Just...why?! dear God, make. it. go. awwaaayyy!!! Yoda's looking a little green(er) these days...0_o Maybe he's got the Dagobah flu? Either that or it looks a little pop-art. But those ears. *shudder* Not appetizing, this cake is. a bad cake that is! It's as if millions of legitimate, talented cake decorators cried out in terror, and were suddenly silenced. I fear something terrible has happened. And that it has ear hair. Look its EToada, after his light saber exploda. When baking a cake with 900 year old ingredients, look like this it well. Gross! The ears hairs made me gag. Slimy? Mudhole? My cake, this is. "Choux or choux not, there is no fly"
Kills a lot of punning birds with one stone, if you see what I mean. May the corpse be with you? I especially like the ear hair. Yoda I like because long poofy ears he has. Long poofy ears this Yoda cake has not. Normally I show the daily wrecks to my husband, but not this one--cry, he might. Was the cake made by JarJar Binks...Really Bad. BTW, how does one put earhair on a cake? Yeah, the hairy ears just add a whole other dimension. Kinda looks like a zombie hobbit, doesn't it? this particular cake is the most unapitizing thing i have seen EVER!!! it makes me want to hurl! I always knew Dustin Hoffman shoulda played Yoda. Just a hop, skip, and jump from Ratso Rizzo. Nothing says "yum, dessert!" like ear hair. I LOVE that this has caught on as "Star Wars Day!" Oh my. It reminds me of this furry sweater someone I know used to have. This though, is so much worse. It looks like Yoda/ET/Dobby is carsick. Ack--the ear hair really gets me! Bad bad bad bad bad. That looks much more like Yogurt from Space Balls than Yoda. wv: acked. Yes, I acked, alright. Well, pooh. I had occasion to visit the local Super Walmart tonight and actually remembered to check their bakery for Wrecks. Alas, they obviously hire only talented decorators, because every cake in there was either a) beautiful or b) completely adorable (the baby turtles were to die for)! Hey, I think it's really cute! So awful it's fabulous. But would I eat it? No. Yoda, this is supposed to be? Yoda, it does not look like. Looks like an old man, it does. A very bizzarely-colored old man with the aforementioned scary ear hair. Is that mould on the bottom of it? If only I'd known about this blog three years ago, I'd have sneaked a few photos from the cake 'shop' (I use the word shop very loosely because it never sold anything) in my town center for you. Especially the wedding cake that had been in the window since uh, I moved to this town. 13 years ago. I was going to say that, really, it's not that bad, but the mold kinda loses it for me. UCK! Someone please use the force to make this cake appear appetizing. That was Yoda? Dang. I thought it was Mr. Miyagi. "Shoo, or shoo not; there is no fly." OMG...so funny. It looks like someone ran the yodbbyet cake over with a speeder. wv untsms...sentences that begin with words starting with un. "Underestimated the approach of speeder you did." I have found that the comments are sometimes as funny as the blog! I dare not show this to my father! I think he might turn to the dark side and strangle me! My favourite post EVER. And forever. You are so hilarious Jen, I don't know how you do it. Thanks for the Star Wars Day post! My 11 year old noticed that Yoda looks alot like the lettuce on the cover of the book advertised next to the post! Come to the Dark Side! We have really ugly cakes!! It also looks a lot like Evinrude from the Rescuers. I think it looks like a cross between Yoda and that blue Sesame Street muppet Rosita. haha shouldn't it be, 'shoo or shoo not, a fly there is not'? I showed this picture to my father, and his reaction was, "Looks like a fungus." I forgot to celebrate Star Wars Day this year...dangit! I'm glad someone did. This looks a bit like the Muppet Gonzo, for me. The ear-hair effect is striking, and somehow much better than the rest of the cake. Queer and unusual. I just found your blog today and am having one heck of a time reading everything. That has to be the ugliest cake I've ever seen! Who would even want to eat icing that is that garish colour?! Forget about clowns. THIS is scary!